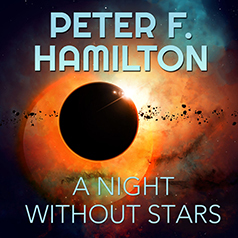 Acclaimed science fiction author Peter F. Hamilton presents Book 2 of his Chronicle of the Fallers series. Kysandra, known as the Warrior Angel, heads up the Eliter resistance. With their enhanced capabilities and technological know-how, they could avert disaster, but only if the authorities stop hunting them at every turn. Then, as both resistance and government are caught in a desperate race to save lives, the planet receives an unexpected visitor. As events escalate, petty power-plays, politics, and age-old prejudices may prove fatal. And as the more sophisticated hostiles can hijack a human body, humanity is undermined by spies within—wearing the faces of family and friends.